Striking ShanOre sterling silver Trinity Knot earrings with three brilliant Swarovski® Crystals featured in an elegant earring jacket design. By buying this product you can collect up to 79 loyalty points. Your cart will total 79 points that can be converted into a voucher of $3.95. The power of three is strong in this fun and elegant design. A traditional Trinity Knot emblem is featured as the most central point of the design, crafted from a single, unbroken sterling silver line forming three points. Below the lobe and highlighting the Trinity Knot symbols rests three beautifully set dazzling white crystals from Swarovski. Three pointed structures are often a symbol of strength, and this particular design showcases that idea of strength with incredible beauty. The Trinity Knot is, throughout Celtic tradition, a representation of three important ideas. Whether of a spiritual nature or a personal one, they intertwine and depend on one another - each necessary to survive. These three ideas could be past, present and future or The Holy Trinity. 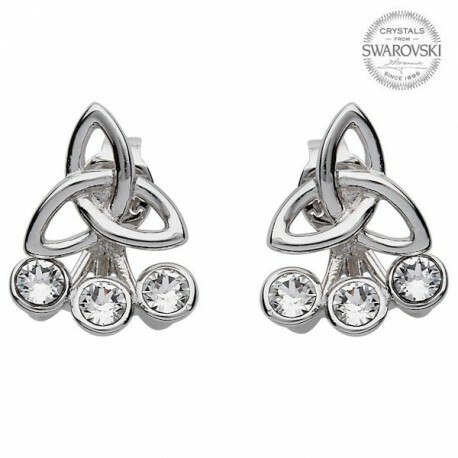 For the wearer's personal significant attachment to the design there is an embellishment for each point fashioned in brilliant, beautiful and strong crystals from Swarovski. Rich traditional symbolism is modernized with style and beauty in striking sterling silver details and dazzling white Swarovski crystals. These earrings are uniquely exceptional. Gift them to yourself or as a symbolic gesture to someone most deserving of such exquisite earrings.